I like trading options because they are the most versatile financial instruments I’ve traded in 17 years. I have been trading stocks, bonds, futures and options on stocks, indexes, currencies and commodities and I’ve found options to be the best instrument to implement trading & investment strategies. Let’s demonstrate this by taking a basic example of trading the stock of a relative solid business compared with trading the options of that stock. Trading options or trading stocks? Let’s assume you would like to own Aaple Inc. (AAPL) which is trading today for $102.20 a share. To buy 100 Apple shares you need a capital of $10,220 ($102.20 x 100 shares). You buy the shares and “block” $10,000 as margin for the trade. However, let’s see what happens if instead of buying shares you sell a Put option with the strike of $100, expiring in 32 days, for which you collect $4.10 credit. Not only that you block only 20% ($2,000) as margin to sell that Put, that is five times less than the margin needed to buy the stock, but you end up in much better shape. AAPL ends up below $100 per share (let’s say $97): if you own 100 shares you end up losing $520 (5.09%) on margin; if you sold the Put, you get assigned on it and have to buy 100 shares for $100 each; you also keep the premium collected ($4.10 per share) so actually end up owning AAPL share for $95.90 ($100 – $4.10). As AAPL market price is $97, you could sell the shares right away and still have a $110 (1.13%) positive return on margin. The above example shows the superior results of trading basic options strategies over trading stocks. That is judged by the account (margin) size needed and risk control available but that is not everything. More complex strategies for managing a portfolio could not even be imaginable by just trading stocks. On the opposite, a large variety of strategies become possible by trading options. 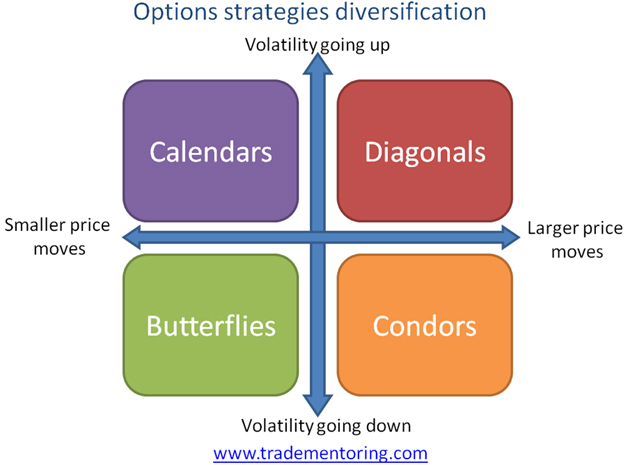 Although we name them Calendars, Butterflies, Condors or Diagonals they are all variations of simple options spreads. Diversification becomes crucial when managing an options portfolio. We diversify by the underlying instrument (stocks, indexes, ETFs), by the number of days until expiration (DTE), by the number of days in trade (DIT) and by the type of strategy we use. We can go further and diversify by volatility range at entry, by the day of the week when we put on trades and by the way we manage the trade between entry and exit. Diversification is key to a healthy portfolio management and increases your chances of high returns. Consider learning the essentials of trading options by taking our class Options Seminar – The Essentials and then going to a more advanced level with the 10% Profit per Month Program. Stay healthy and get wealthy by trading options!